Each year, hundreds of millions of plants and animals are caught or harvested from the wild and then sold as food, pets, ornamental plants, leather, tourist curios, and medicine. While a great deal of this trade is legal and is not harming wild populations, a worryingly large proportion is illegal — and threatens the survival of many endangered species. With overexploitation being the second-largest direct threat to many species after habitat loss, WWF addresses illegal and unsustainable wildlife trade as a priority issue. Whenever people sell or exchange wild animal and plant resources, this is wildlife trade. It can involve live animals and plants or all kinds of wild animal and plant products. Wildlife trade is easiest to track when it is from one country to another because it must be checked, and often recorded, at Customs checkpoints. Why do people trade wildlife? People trade wildlife for cash or exchange it for other useful objects - for example, utensils in exchange for wild animal skins. Driving the trade is the end-consumer who has a need or desire for wildlife products, whether for food, construction or clothing. For a more detailed list of the various uses of wildlife, visit the TRAFFIC website. What is wildlife trade worth financially? This is a difficult estimate to make. As a guideline, TRAFFIC has calculated that wildlife products worth about 160 US billion dollars were imported around the globe each year in the early 1990s. In addition to this, there is a large and profitable illegal wildlife trade, but because it is conducted covertly no-one can judge with any accuracy what this may be worth. What is the scale of wildlife trade? The trade involves hundreds of millions of wild plants and animals from tens of thousands of species. To provide a glimpse of the scale of wildlife trafficking, there are records of over 100 million tonnes of fish, 1.5 million live birds and 440,000 tonnes of medicinal plants in trade in just one year. Why is wildlife trade a problem? 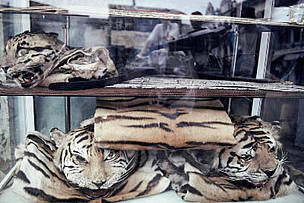 Wildlife trade is by no means always a problem and most wildlife trade is legal. However, it has the potential to be very damaging. Populations of species on earth declined by an average 40% between 1970 and 2000 - and the second-biggest direct threat to species survival, after habitat destruction, is wildlife trade. Perhaps the most obvious problem associated with wildlife trade is that it can cause overexploitation to the point where the survival of a species hangs in the balance. Historically, such overexploitation has caused extinctions or severely threatened species and, as human populations have expanded, demand for wildlife has only increased. Recent overexploitation of wildlife for trade has affected countless species. This has been well-publicized in the cases of tigers, rhinoceroses, elephants and others, but many other species are affected. ...because it harms human livelihoods. Wildlife is vital to the lives of a high proportion of the world's population, often the poorest. Some rural households depend on local wild animals for their meat protein and on local trees for fuel, and both wild animals and plants provide components of traditional medicines used by the majority of people in the world. While many people in developed countries are cushioned from any effects caused by a reduced supply of a particular household item, many people in the developing world depend entirely on the continued availability of local wildlife resources. ...because it harms the balance of nature. In addition to the impact on human livelihoods caused by the over-harvesting of animals and plants is the harm caused by overexploitation of species to the living planet in a wider way. For example, overfishing does not only affect individual fishing communities and threaten certain fish species, but causes imbalances in the whole marine system. As human life depends on the existence of a functioning planet Earth, careful and thoughtful use of wildlife species and their habitats is required to avoid not only extinctions, but serious disturbances to the complex web of life. Particular problems are associated with illegal wildlife trade, which is usually driven by a demand for rare, protected species which need to be smuggled and/or by a desire to avoid paying duties. In illegal wildlife trade, some species involved are highly endangered, conditions of transport for live animals are likely to be worse and wildlife is more likely to have been obtained in an environmentally damaging way. The existence of illegal trade is also worrying because it undermines countries' efforts to protect their natural resources. Introducing invasive species which then prey on, or compete with, native species. Invasive species are as big a threat to the balance of nature as the direct overexploitation by humans of some species. Many invasive species have been purposely introduced by wildlife traders; examples include the American Mink, the Red-eared Terrapin and countless plant species. Incidental killing of non-target species, such as dolphins and seabirds, when they are caught in fishing gear. It is estimated that over a quarter of the global marine fisheries catch is incidental, unwanted, and discarded. Incidental killing of animals also happens on land when crude traps are set (for example, for musk deer or duikers). These cause damage and death to a variety of animals besides the intended ones. Finally...while wildlife trade alone is a major threat to some species, it is important to remember that its impact is frequently made worse by habitat loss and other pressures. WWF's range of expertise ensures that the threats to the environment from wildlife trade are tackled from an informed and global standpoint. 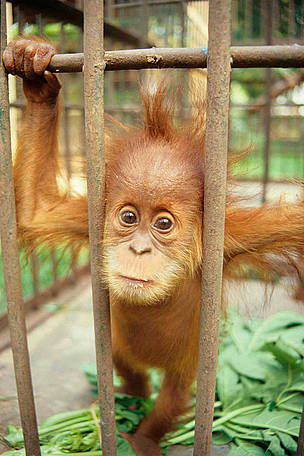 Captive baby Sumatran Orang-utan (Pongo abelii). 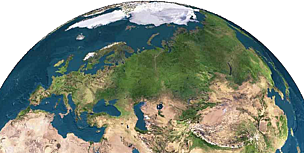 Are there particular trouble spots geographically? There are certain places in the world where wildlife trade is particularly threatening or where targeted action would be particularly worthwhile. These places are sometimes called 'wildlife trade hotspots' and include, for example, China's international borders and the eastern borders of the European Union. While these hotspots might be trouble areas at present, they also offer opportunities for great conservation success, if action and funds are well-focused. The ONCFS (National Office of Hunting and Wildlife) mobile brigade of intervention is often called to record and deal with illegal trading in species. 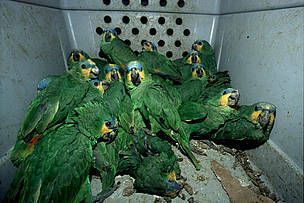 Guatemala Amazon or Blue-crowned Amazon in a cage for transport. French Guiana. There are three key areas where WWF and TRAFFIC work to address the threat of the illegal wildlife trade. WWF provides technical and scientific advice to the Convention on International Trade in Endangered Species of Wild Fauna and Flora (CITES). WWF and TRAFFIC carry out cutting-edge research on illegal wildlife trade routes, the effects of wildlife trade on particular species, and on deficiencies in wildlife trade laws — information which is essential for CITES members to keep abreast of new trends and react accordingly. This research is used to create new plans for dealing with the illegal widlife trade and also helps WWF and TRAFFIC promote the inclusion of new species in the CITES appendices or resolutions. It’s one thing to ban or limit trade in a particular species, but another to effectively enforce this — especially in developing countries where equipment, training, and funds for enforcement are often lacking. In addition, many countries still lack strict national legislation and/or appropriate penalties for illegal wildlife trade. To address this challenge, WWF helps countries comply with CITES regulations by helping to develop programmes, create regulations, runs workshops, assists enforcement efforts and funds anti-poaching brigades. One of the most powerful tools of all for addressing illegal and unsustainable wildlife trade is to persuade consumers to make informed choices when buying wildlife-based products. This includes not just the people buying the end product, but also shop-keepers, suppliers, and manufacturers. WWF actively discourages the purchase of certain wildlife goods and encourages the production and purchase of sustainable wildlife goods such as those certified by the Marine Stewardship Council (MSC) and Forest Stewardship Council (FSC). WWF also works hand-in-hand with many communities around the world, providing practical help to overcome poverty and helping them use their local wildlife in a sustainable way. Learn more about WWF's work to combat the trade in endangered species. 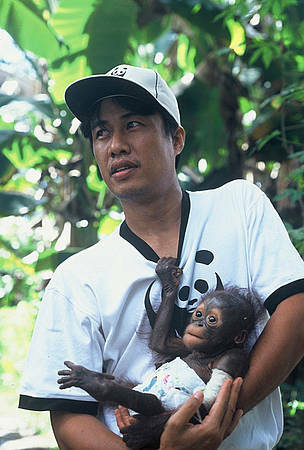 Syahir Syah of WWF-Kapuas Hulu holds Monyong, a baby orang-utan that was saved from the illegal wildlife trade. Washington, USA, 6th August 2018—A new analysis of global wildlife trafficking seizures in the air transport sector reveals that wildlife traffickers are highly dependent on commercial air transportation systems to smuggle endangered wildlife. Learn more about priority species that are at risk from the illegal wildlife trade.